Good Thursday to you, friends! Popping back in today with a couple of painting projects I’ve been working on this week. The weather has been perfect to get a few things done so that’s been my focus. But first, I wanted to share a note about Legacy with you. As I’ve been writing that story out, it’s been very healing for me and helpful in terms of processing what happened. If you’ve been following along, you might already realize that Legacy Christian School has become a reality over the past few months — a joyful reality. Check out our website HERE! And as we finalize things to open our doors this August, I’ve decided to reign in the telling of the story — for now. There is so much ugliness that happened — faith-growing, brutally HARD ugliness. And while all of that is important in the story of how “we” came to be, I don’t want that part of the story to undermine the wonderful that is happening now. I know that God will let me know when it’s time to tell the Legacy story in its entirety. But that time is not now. We’re rejoicing in a home for our school, for healthy enrollment, and an amazing partnership with a local church that shares our vision and mission of ministering to the children and families in our community. God is faithful!! There is no question He has had a protective hand over our school. And I have a sneaking suspicion there will be MUCH more to the Legacy story when all is said and done. So to those that have followed, prayed, supported and encouraged the Legacy story — THANK YOU! You will read the rest in due time, I promise. And it will be a complete story of faith, walking in obedience, hope, fellowship, and God’s grace! Now, on to my “projects”! 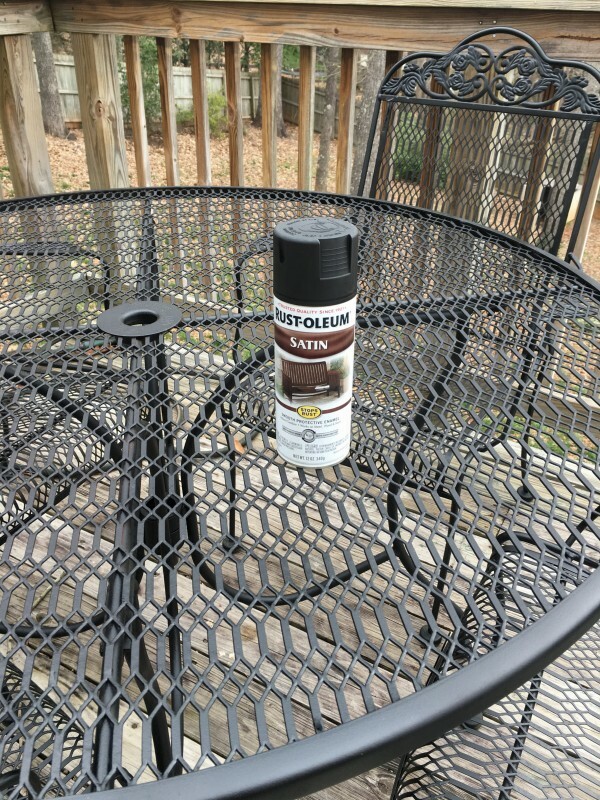 Remember that I mentioned I spruced up my in laws’ poolside furniture last weekend? Well, it inspired me to tackle my own, before the pollen explodes! Y’all! 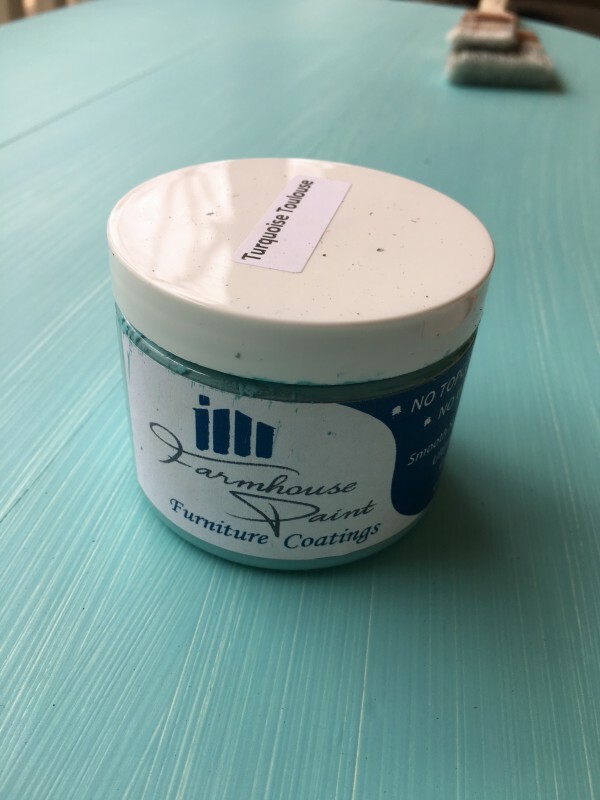 I hit it with a wire brush first to remove any loose paint and rust, wiped it down with a clean cloth and then gave it two coats of Rustoleum Satin spray paint. (afilliate link) The difference is amazing! I didn’t realize how dull the finish had become after ten years of exposure. But it’s super-refreshed now and ready for deck-sitting season! Of course, I was then pumped up to pressure wash the deck and get my pots planted, etc. But alas, I was informed that our pressure washer was down at the farm and wouldn’t make it home for a couple more weeks when the hubs goes down there to turkey hunt. #thwarted So I’ll have to live with my dingy deck and stairs for a while longer, but my furniture looks spectacular. This little piece is handmade and I find its construction a little quirky, but it would be such a cute piece in a child’s room or used as a bedside table. 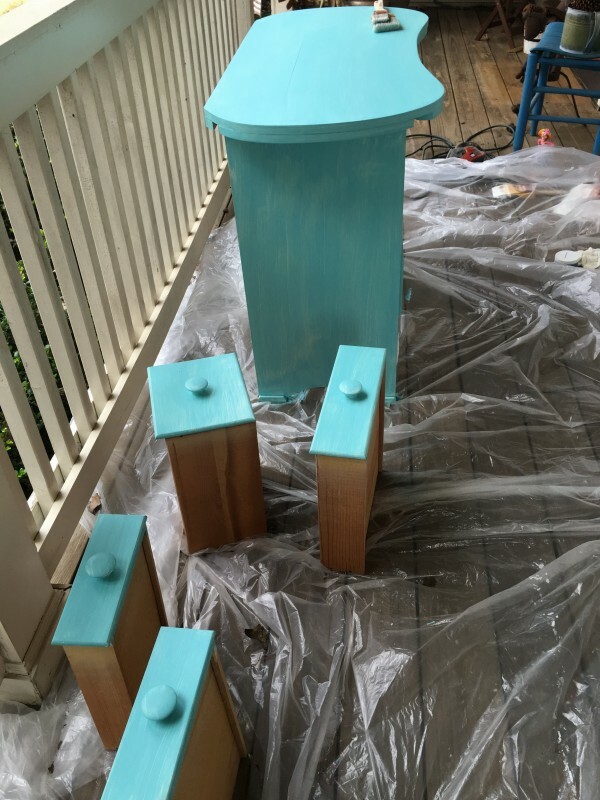 It had a nice coat of white paint on it, but I decided to go with a fun shade of turquoise Turquoise Toulouse to be exact. 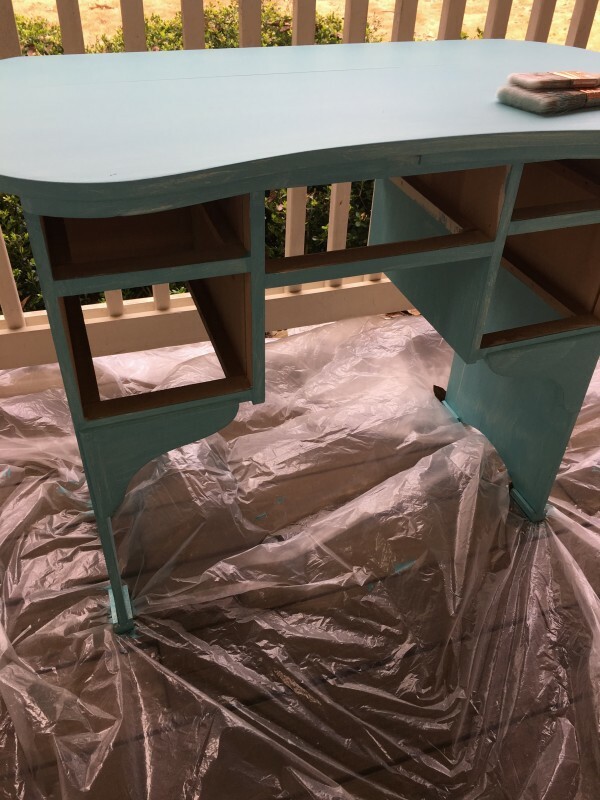 I’ve shared about Farmhouse Paint before (this dresser, this buffet, my fireplace) and I continue to be a raving fan! 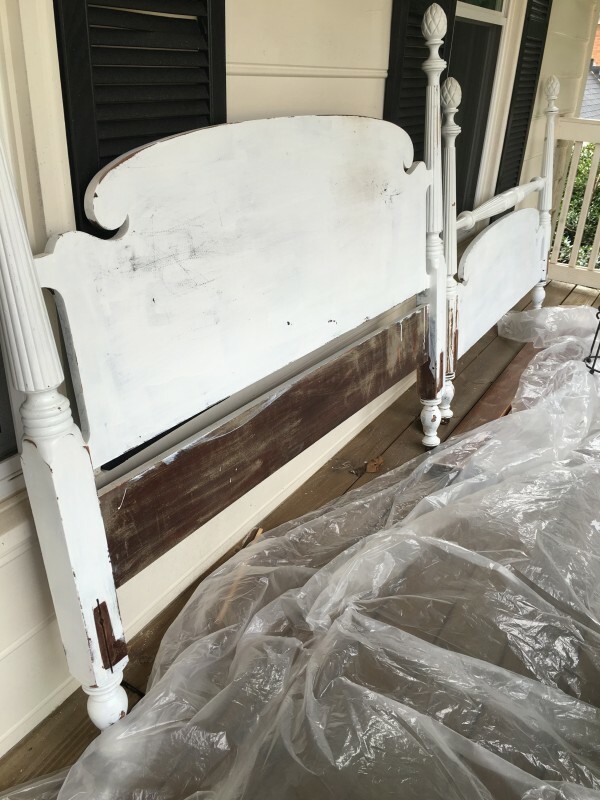 This bed was gifted to me by a friend that was purging… it’s a beautiful piece and I debated about just stripping the paint and restoring the finish. But after looking at the shape of that headboard, I’m envisioning a cool stencil — something simple — right in the middle. So I’m in the middle of sanding this down… it’s taken a beating over the years apparently. I hope to get a couple of coats of paint on by this weekend, and then maybe Y’ALL can help me choose a stencil? Ok, so that’s what I’ve been up to… along with registering students and planning out supplies and staffing for Legacy. Gotta love the GOOD STUFF! So happy for you and the new school!! cassie @ primitive & proper recently posted..Thrift Score Thursday: Bentwood FTW! So happy about the new school. As God leads and directs He will let you know when He wants you to share your testimony about the school! God is awesome. three months ago our daughter shared prayer needs for her family. God opened doors no man could of opened and our son-in-law has a new job! God’s timing is never late Praise God! So excited for your new venture!! I can see why you may want to pull back about the Legacy story while enrollment is open and the school is getting started. But I wanted to say that for me, reading your blog posts about it really helped me in making the decision to enroll my child at Legacy. Hearing the story from your blog was much better than not knowing the background and letting my imagination wander. And hearing about the passion that you and the teachers have speaks volumes about the people involved with Legacy and gave me a lot of peace of mind.